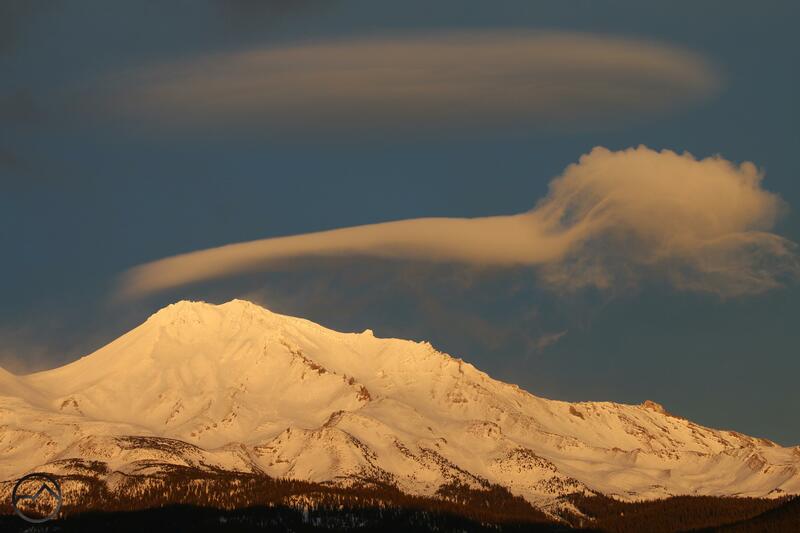 Shadow and light dance around the lenticular above Mount Shasta. 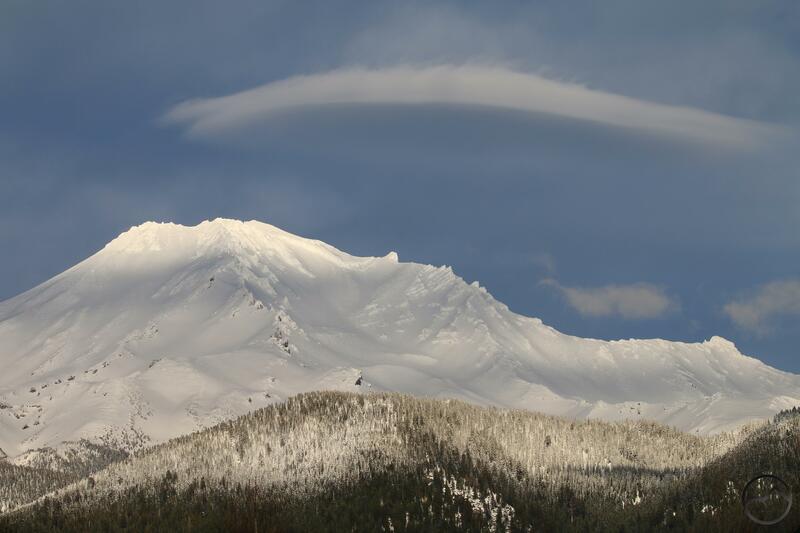 The last 36 hours have seen some extraordinary lenticular activity around Mount Shasta. The clouds that formed around the mountain, beginning Thursday afternoon, produced some of the most impressive formations I have seen in a while, and are easily the most spectacular that have formed thus far this lenticular season, though there have been some excellent manifestations prior to these most recent specimens. However, despite the incredible nature of these clouds, for the most part, they proved extremely frustrating for photography. Their timing, the constant filtering of light and their seeming knack for dissipating at critical moments made them quite vexing. 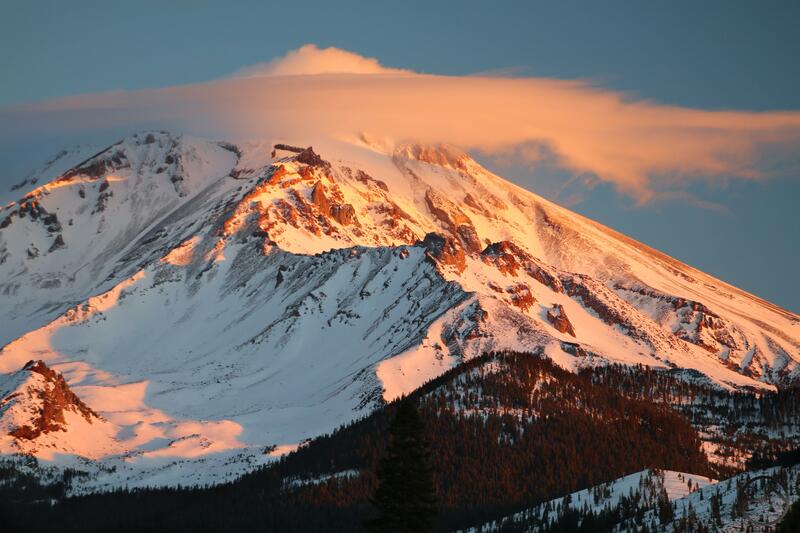 Nonetheless, it is better to have witnessed them, appreciated them and recognized the grandeur of Mount Shasta than for the days to quietly slip by without momentous events such as these. I want to document how things manifested. As I have done in the past, I want to do so mostly through images and captions and try to limit the amount of prose. I hope this works and is an enjoyable read! Unfortunately, around sunset the cloud dissipated to just a remnant of what had just an hour earlier dominated the view of Mount Shasta. That evening, looking at the weather reports, I had a suspicion that the clouds might continue and build through the night. I got up early to check out what was there in the morning. I was not disappointed with what I found…at first. 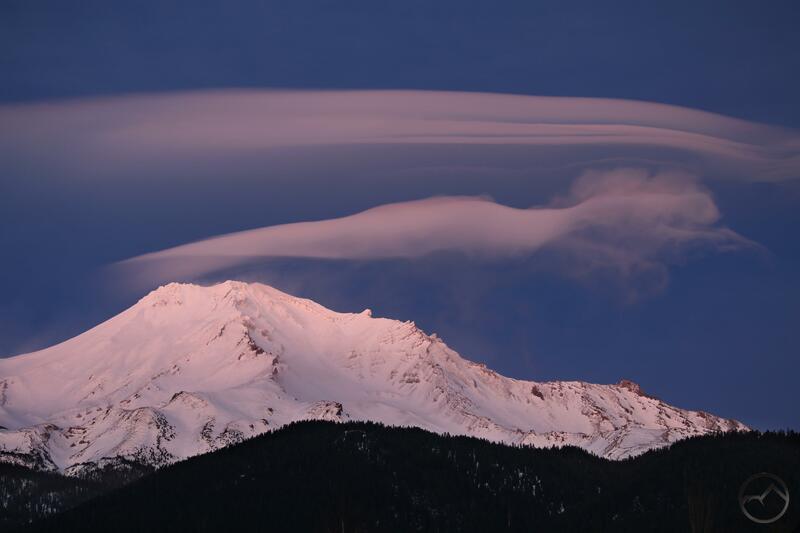 By morning, the lenticular from Thursday had grown to an impressive stack hovering above the mountain. I expected a grand sunrise but it never came, since clouds to the southeast block all but just a trickle of the morning light. The scene never lived up to my hopes. The cloud was redeemed in grand fashion as it neared midday. 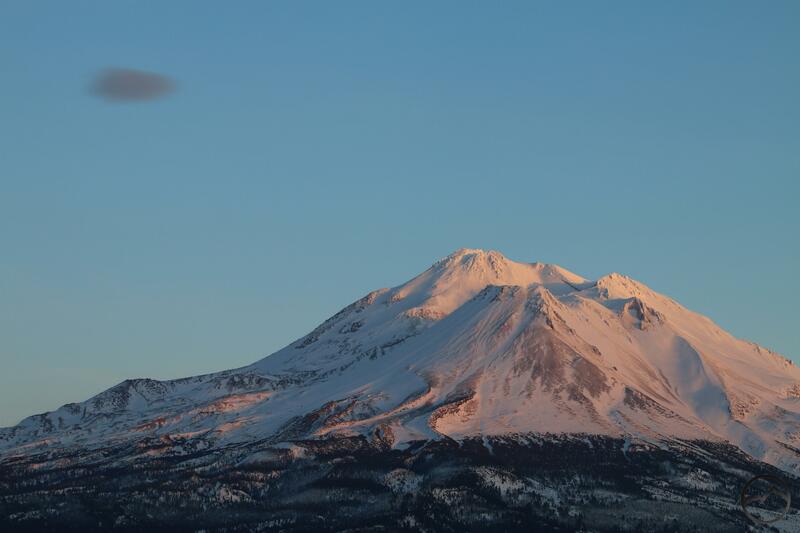 Though Mount Shasta never really caught any light, the cloud itself continued to grow and it glowed in the light of the sun, still climbing toward its noon apogee. 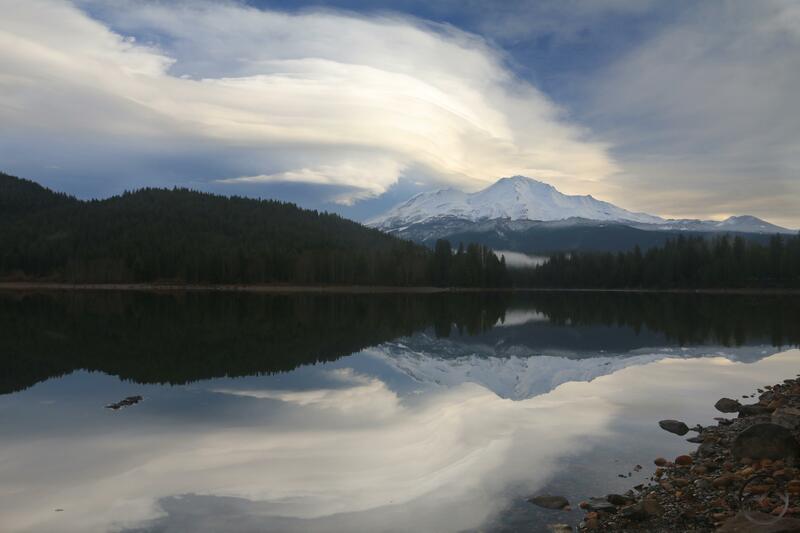 I thought of heading up to Castle Lake to get some images of it but, seeing the stillness at Lake Siskiyou, I knew that a magnificent reflection awaited. I was not disappointed with what I saw. From that point on, I headed out to Burney Falls with the outdoor education class I teach on Fridays. Even from out there, I could see the massive clouds above the mountain. On the way back Mount Shasta was lit up and the clouds were filled with light. I toyed with stopping in McCloud and capturing a shot. I opted not to in order to get the class back on time but now I wish I had. After dropping the outdoor education class off, I decided to head up to Castle Lake for the sunset. On the way up there I paused to capture some images of Mount Eddy, which had its own set of interesting clouds. 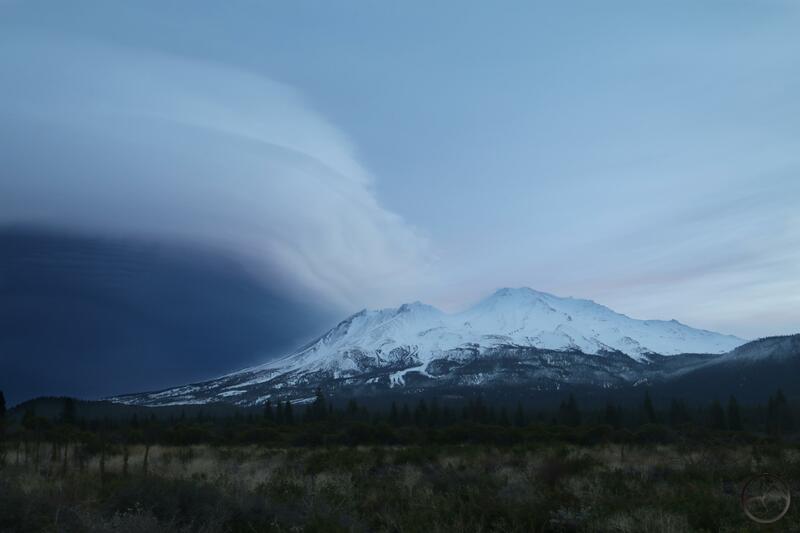 With little warning, a stream of narrow clouds began coalescing as the current pushed it past Mount Shasta. The stream of clouds, indicative of some serious turbulence, began expanding, blocking out the lower stack of lenticulars. 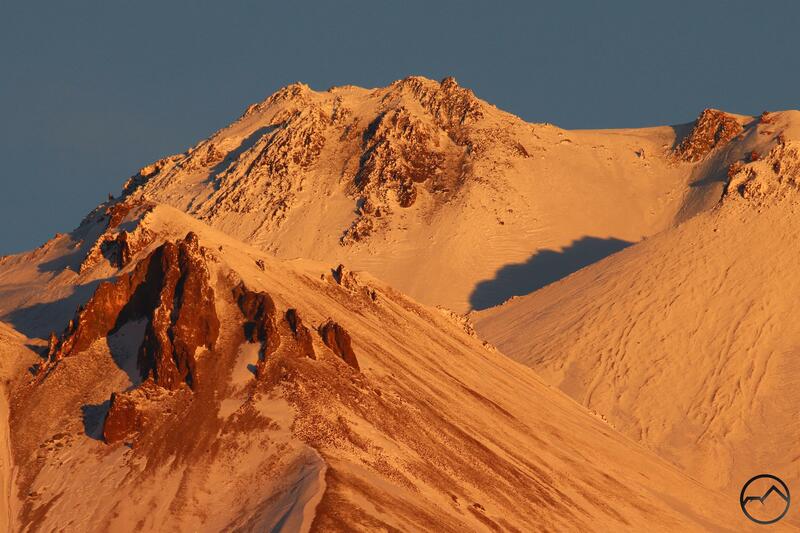 The alpenglow lingers on the the highest reaches of Mount Shasta. The light totally gone from the mountain, the lenticular lit up again, though the view of it was heavily filtered. Strangely, a spot beneath it also glowed with purple light. The whole spectacle was undoubtedly awesome but still frustrating. This was one of the twice-per-year lenticular events and I had missed really capitalizing on it. In spite of the missed opportunity, I am truly grateful to have been present for the majestic display of grand creativity. The show over, I had a suspicion that the lenticulars might still be there in the morning once again. Since I am a glutton for frustration, I got up early once again, this time heading over to McCloud. The cloud was indeed still there. Its diameter was much smaller but it still formed a fantastic stack. However, the sun was not up and I did not know the disappointment that lie ahead. Still, if the sun came up, the single disk would still be a nice image. Of course, the cloud had other ideas and continued to shrink. The last pitiful remains of a once staggering lenticular quickly disappear. Adding insult to injury, the light was extremely filtered and the glow of the rising sun that should have lit up Mount Shasta was barely discernible. I was just about to pack up my camera when the sun finally climbed high enough for its light to shoot over the clouds. 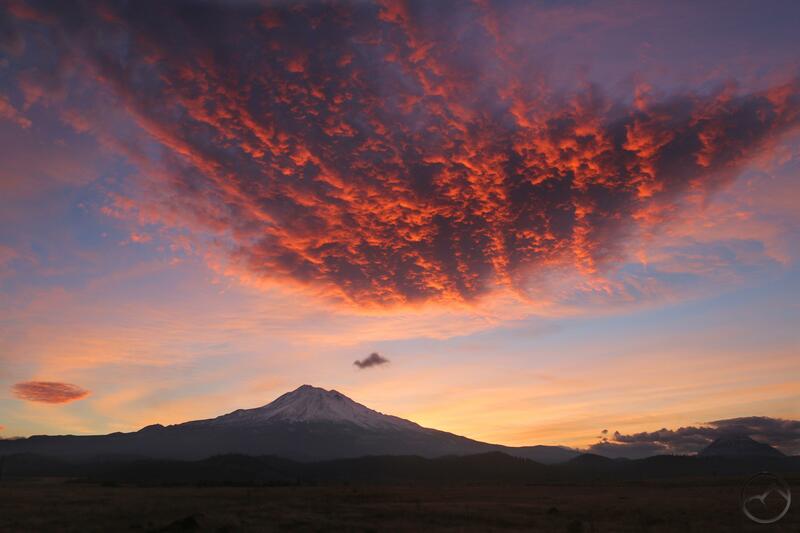 Mount Shasta erupted in light. Glad to at least see that, I was also hopeful some newly formed clouds might pull together to form another lenticular. This was not to be but I did not feel too gypped, as the entire spectacle the last 36 hours was grand. I am grateful to have been present for it and been witness to the birth, life and death to so sublime a phenomenon. 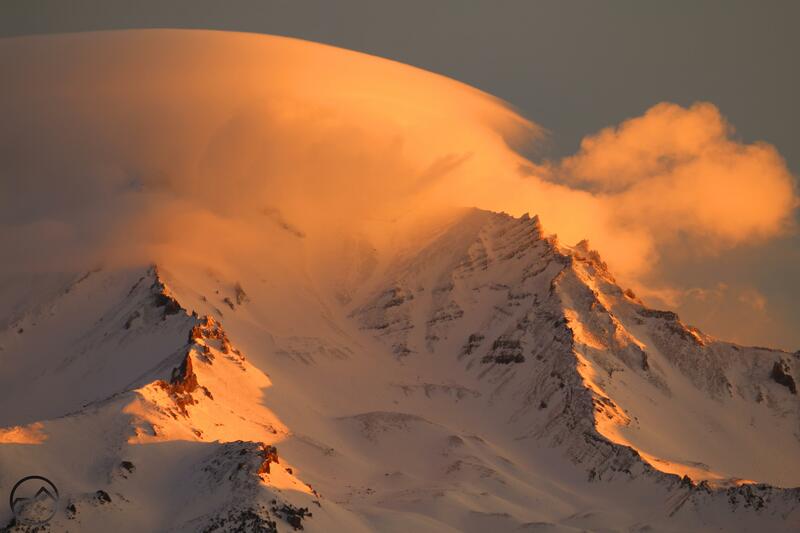 Awesome winter light, fresh snow and a lenticular cloud make for a spectacular mountain. The storm that dumped snow and drenched the area in a deluge of rain having passed, today revealed a stark white Mount Shasta. Low clouds drifted through the area constantly and it wasn’t until the afternoon that the skies around the mountain really opened up, but once it cleared, the mountain glittered in the sunlight. The real highlight came in the mid-afternoon. I took my daughter to her dance class and I had an hour to kill with her brothers before picking her up. As the kids ran around Sisson Meadow, a nice lenticular formed over the mountain. Making the scene even more interesting was the filtered light that gave Mount Shasta a dappled appearance. 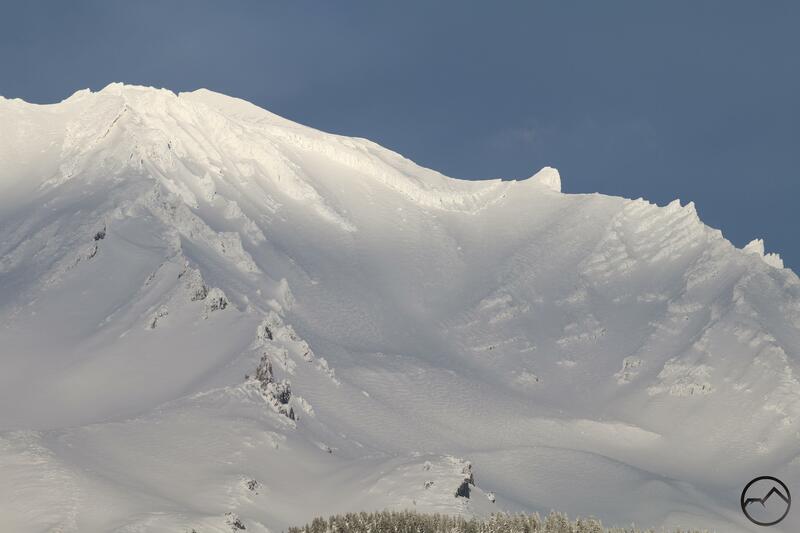 The light also highlighted a lot of Shasta’s features, especially those around Avalanche Gulch. Snow covered everything and the features that jutted out of the flanks to for the jagged landscape were thickly coated with rime ice. Click and enlarge this one to see the detail. After picking my daughter up, I thought it might be good to head north and check out the sunset from the Shasta Valley. The storm has resuscitated one of my favorite sunset spots where, during wet winters, it is possible to get reflections of the mountain when the wind is not blowing. Unfortunately, the wind is often blowing in the valley and this was the case tonight. Even more frustrating, the lenticular had faded into an uninteresting splotch in the sky. There would be no distinctive sunset tonight. The lenticular was still there, but not much was left. Despite the disappointment in not getting either a lenticular sunset or a nice reflection (or both), the conditions were still beautiful. Even Black Butte was looking unusually scenic, with just a hint of alpenglow on the highest point of the little mountain. 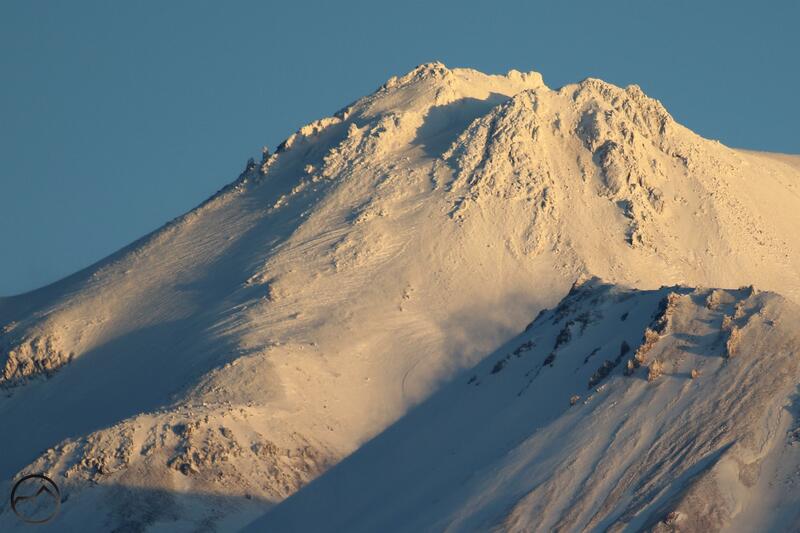 While all the other features were absent, Mount Shasta itself never fails to disappoint. 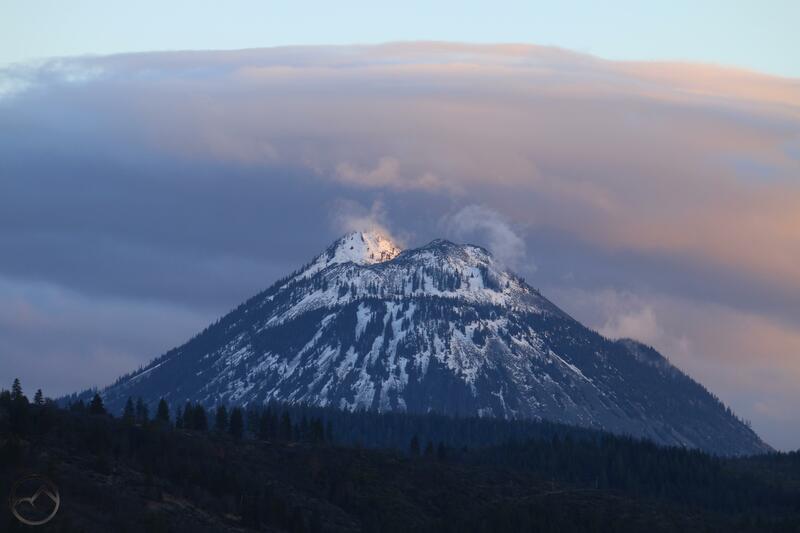 In this case, the mountain was showing off its new snow with a billow plume being blasted off of Shastina. 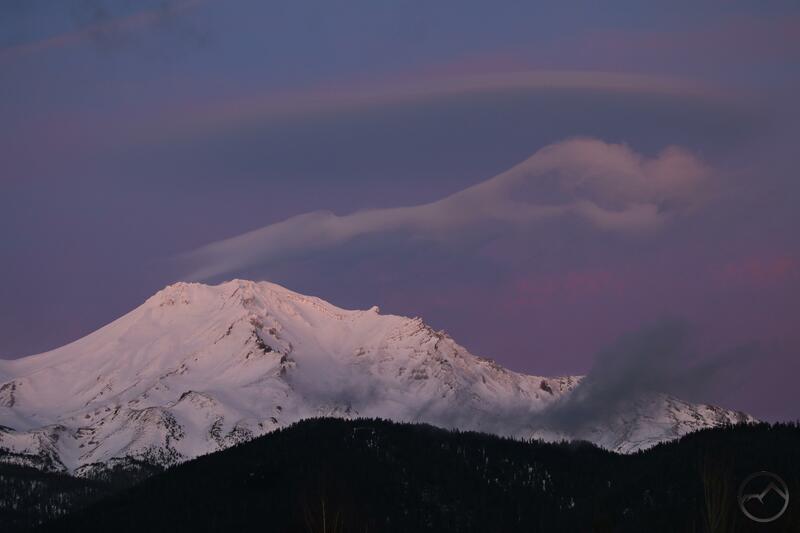 The plume itself was in Shastina’s shadow but it contrasted dramatically against the fledgling alpenglow that now drenched the higher flanks of Mount Shasta itself. It was one of those scenes that just looked big. I was grateful to have a chance to watch it while all my kids climbed on rocks, through stones in the puddles and just ran around noisily in the Shasta Valley wind. 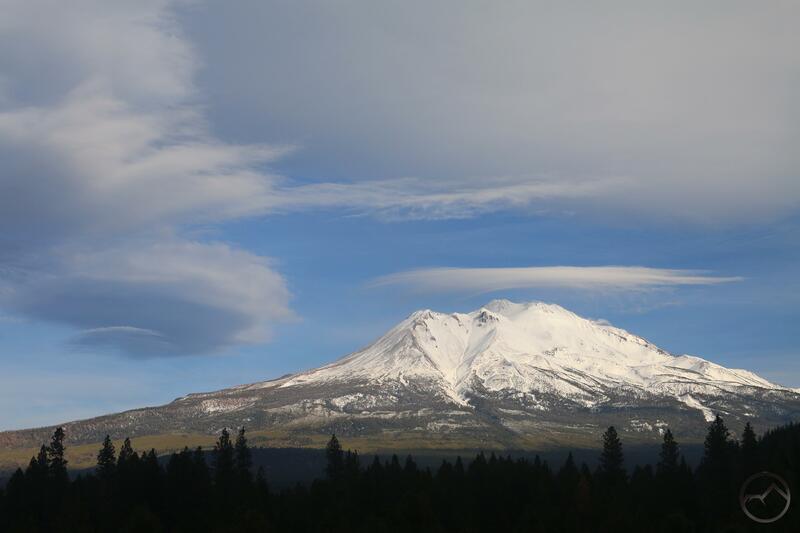 It was nice break from the stormy weather and, all in all, a nice reminder of how awesome Mount Shasta really is. The darker it got, the more definition the lenticular took on. It remained a striking spectacle. 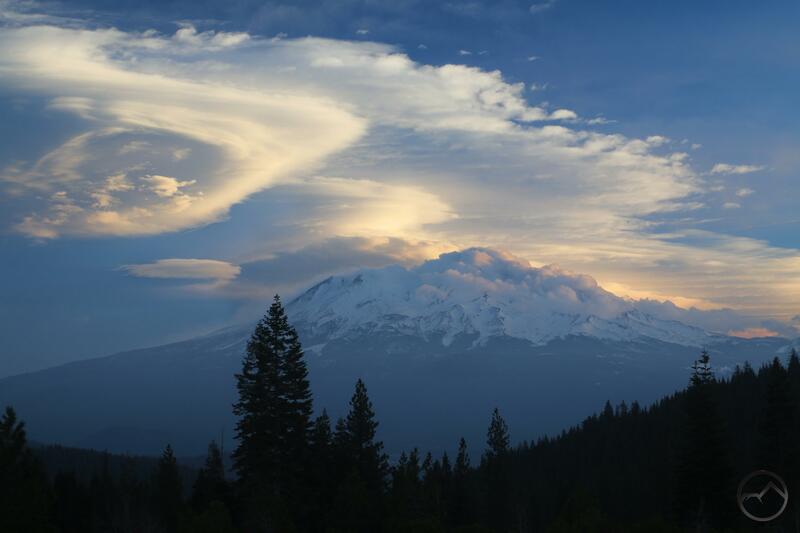 A lenticular cloud floats above a large wave over Mount Shasta. 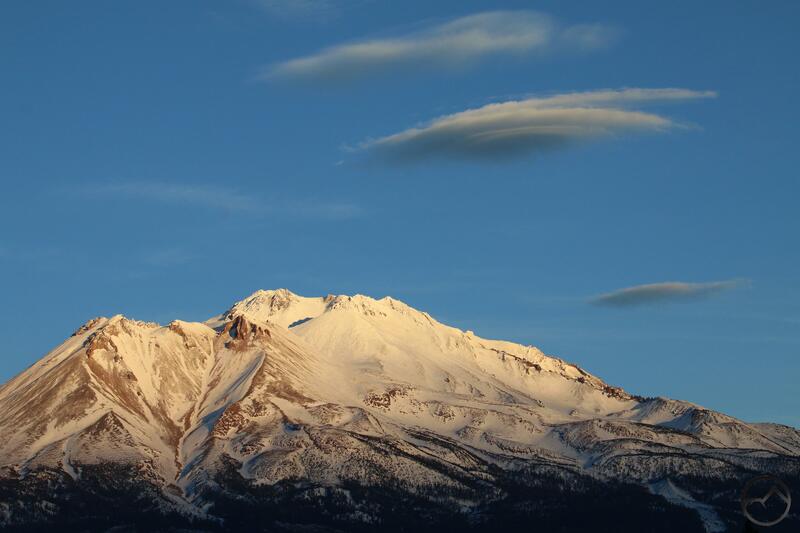 Last Sunday featured an excellent lenticular display on Mount Shasta. The day started with nary a cloud in the sky but by midday it had become overcast and a very large stack of disks had manifested over the Mountain. 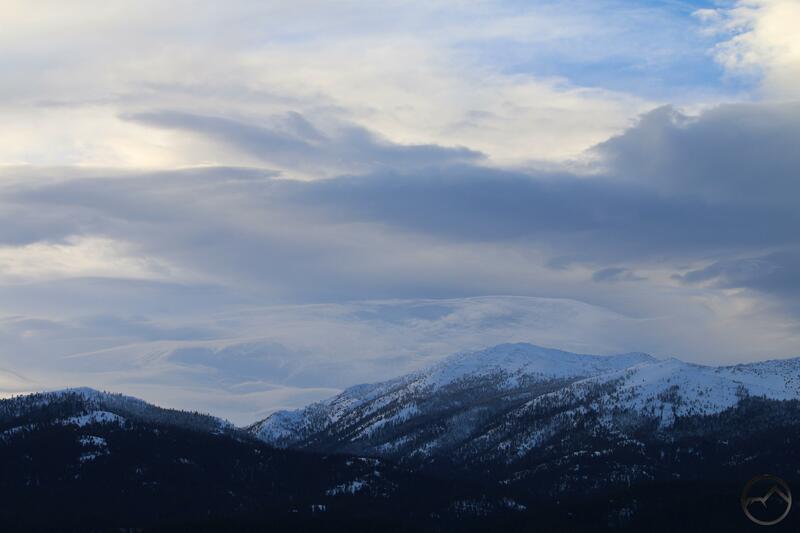 Near sunset, the overcast skies had cleared, though a large bank of clouds still threatened just north of Mount Shasta. Unfortunately the large stack had gone but in its place a large wave had formed and seemed to be blowing off of the summit. In spite of the lenticular’s disappearance, I decided to stick around and document the spectacle. The wave extended from just north of the summit to the south, reaching well past Shastarama Point. This gives it a linear distance of nearly 3 miles. The cloud undulated majestically in place, the far end seeming to fray and then disappear. Though I was disappointed the circular clouds were gone, the wave had an elegant beauty of its own and I was glad to have been able to witness and enjoy it. However, without warning as the sun began to set, a disk suddenly emerged out of nowhere. It was a very welcome addition to an already interesting sunset. The disk remained static for a while all the time the wave continued to surge amidst the obviously turbulent air around Mount Shasta. The stable disk and the chaotic wave were a striking contrast. However, after a few minutes in this state, something unusual took place. The large, frayed end of the wave broke free from the rest of the formation. This on its own was not odd but the south end of the disk suddenly broke away from the main cloud and stayed with the frayed cloud as it drifted further south. 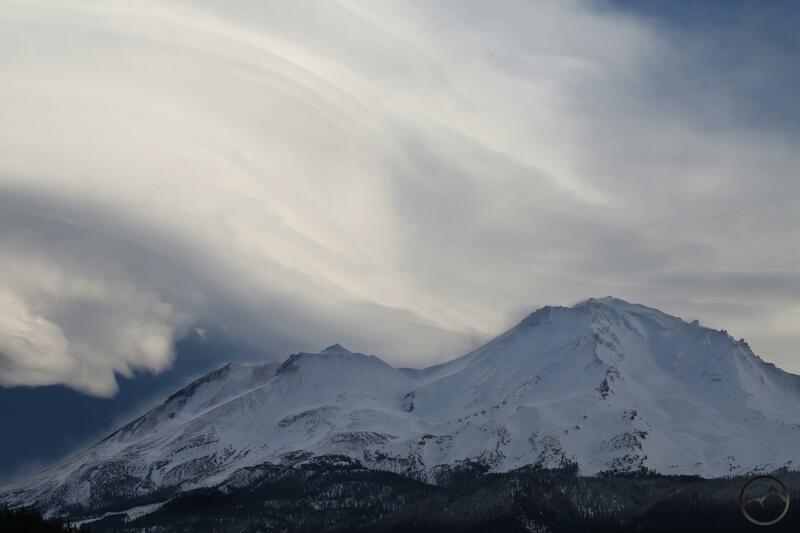 I have seen waves over Mount Shasta before and I have seen plenty of lenticular disks. They are obviously related in terms of the turbulence in the air and the wind currents. However, I assumed this was just a general connection. I have never seen the two linked in such terrific fashion. It seems apparent that, though one looks stable and one looks chaotic, the two are linked by some invisible but very strong connection. Evident in the above sequence is the fact that the cloud and it small satellite disk eventually dissipated as they drifted south. The primary disk and wave remained, continuing to regenerate through the fluctuating currents. There was no great consequence to this small but noteworthy and interesting event. 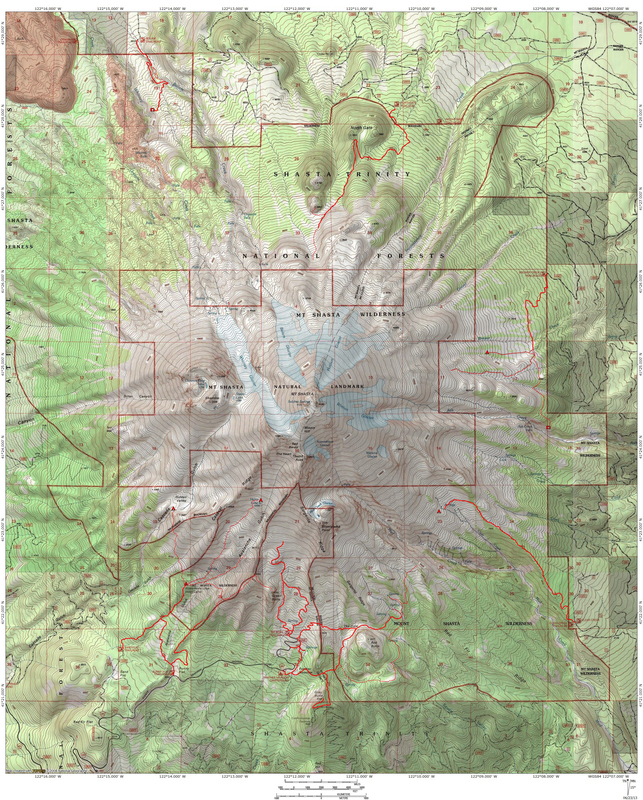 I share it to illustrate the awesome and, in some ways unknowable, power that Mount Shasta has on the environment around it. Though general phenomena repeat, it is always different and filled with great mystery and beauty. It awakens the sense within us that there is something much greater than ourselves out there. The eventually set but the wave and the disk continued into the darkness. It was the last great display of 2018. 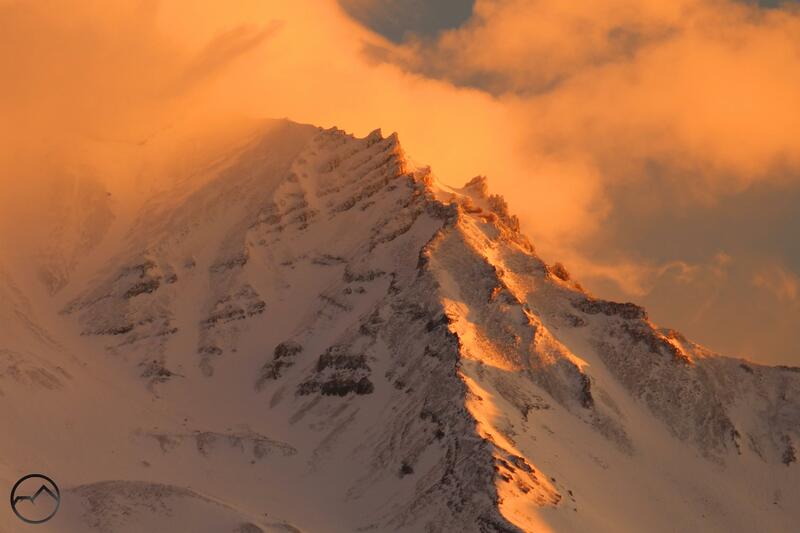 The summits of Mount Shasta and Shastina bathed in alpenglow. 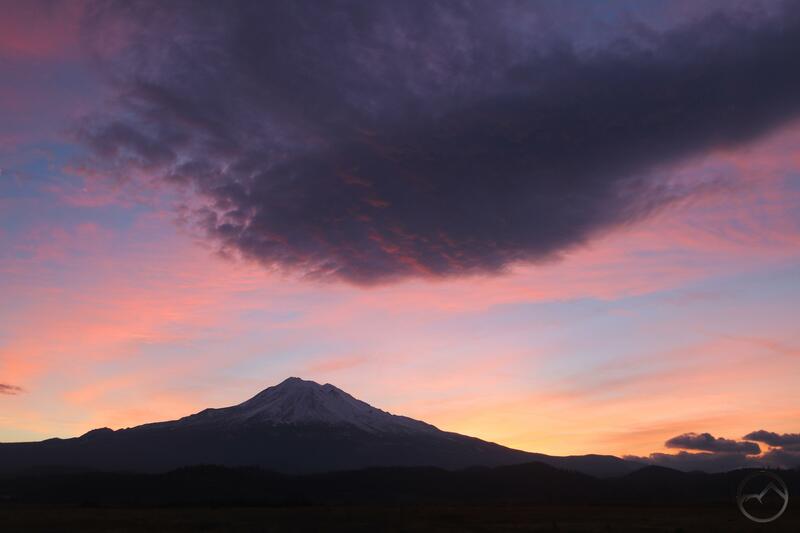 Sometimes even when things don’t quite pan out, Mount Shasta still presents some overwhelming beauty. This was certainly the case this evening. With no really interesting clouds manifesting all day, just before sunset some nice disks started to coalesce above the mountain. I loaded the kids into the car and headed to the nearest easy-to-get-to spot near my house. I unleashed them on their “forts” they have made in some bushes and I watched the sunset from my camera. The kids know the drill and love going with dad to take pictures. Unfortunately, the clouds, though scenic, ended up dissipating before ever really getting going. I note them only because I am a bit obsessive about them. Hopefully I am not the only one who appreciates them. 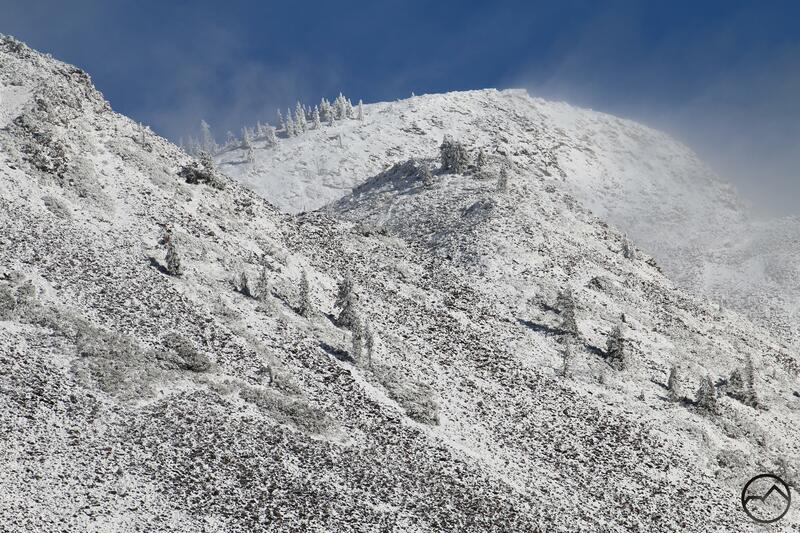 With the new lens I was gifted, I can capture more of the drama and detail of Mount Shasta’s terrain. A lot of these features are really under-appreciated by most save avid climbers. I aim to appreciate them now! 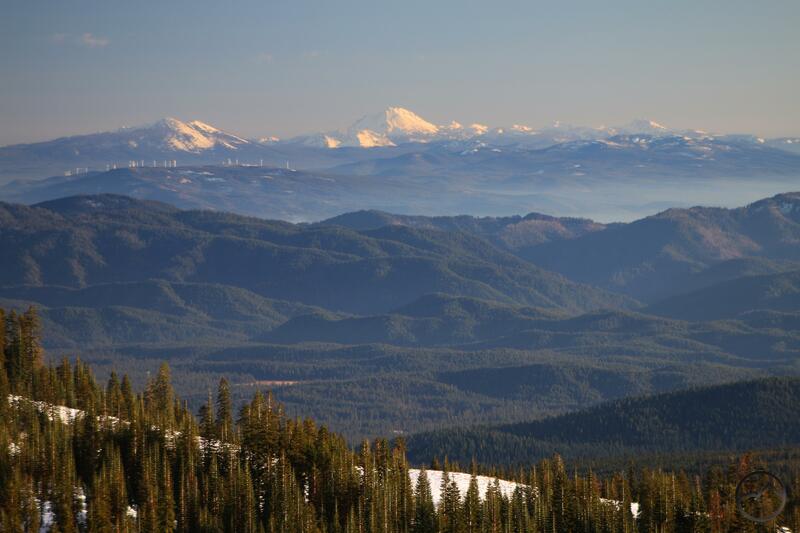 This perspective really contrasts the summits of Shastina and Mount Shasta, which is nearly 2,000 feet higher. The uppermost head of the Whitney Glacier is visible from this perspective as well, just below the almost snowless triangle of rock in the upper right. The large tower at the head of Diller Canyon has always been a favorite of mine. I look forward to exploring it more! I still have a couple of posts I want to get up from the end of the year but they will keep for a day or two more. 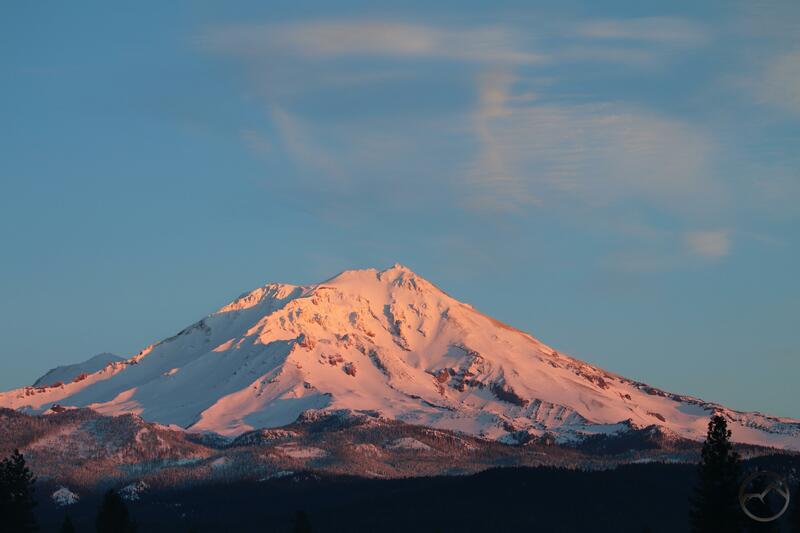 For now, another grand moment around Mount Shasta!